„Schnitzel Parlour“ | © The Schnitzel Parlour Owned by Uwe and Beate Küster, this family business has been serving high-quality, traditional meals in a comfortable atmosphere since it opened in November 2014. It is located in a modified house with two tastefully decorated dining rooms, giving it a welcoming feel. As the name suggests, the Schnitzel Parlour has a wide array of schnitzels, from classics like Jägerschnitzel (schnitzel with a creamy mushroom sauce) and Zigeunerschnitzel (schnitzel with a spicy tomato sauce) to new creations like Bombay curry schnitzel or chocolate-chili schnitzel. Of course, guests can enjoy other German and European specialties as well. The focus is on good, simple cooking, so examples of dishes include Rouladen (usually chopped bacon, onions, and pickles wrapped in thinly sliced beef), house-made Spätzle (German egg noodles), goulash, and a plate of cold cuts served with house-made sourdough bread. Uwe and Beate Küster’s selection of homemade cakes and tortes, as well as handmade Belgian chocolate truffles, can tame any sweet tooth. The rotating dessert menu also includes Sachertorte (a chocolate cake with apricot jam), lemon cream cake, and German-style cheesecake made with quark, a soft German cheese, from the local Boyce Market. When it comes to drinks, guests can order German white wines and beers. This specialty restaurant is ideal for small groups, such as birthday parties and family get-togethers, but engagement parties and weddings wouldn’t be out of place here either. The Schnitzel Parlour offers a specialty menu for New Year’s Eve and Valentine’s Day, and a reservation is a must on these nights. However, it’s a good idea to call ahead on other days as well, as there is limited seating. With the help of his successful ‘private dining’ concept, Uwe Küster has built up a regular clientele, which includes both local fans of German cuisine as well as a growing number of young people interested in trying German food. 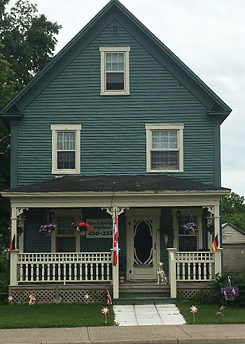 People travelling to Nova Scotia or the Bay of Fundy on summer vacation also stop in Fredericton to eat at Uwe and Beate Küster’s restaurant. The Schnitzel Parlour even caters the military’s Oktoberfest in Oromocto. The restaurant’s soft lighting and elegantly laid tables with black cloth napkins are in perfect harmony with the house’s playful, colourfully patterned wallpaper, the old pictures hanging up around the place, and the warm wooden floorboards. Beate Küster applied her personal style to the decorating, and she also cooks while her husband takes over front-of-house duties. The life-size Victorian Santa Claus standing in the corner will appeal to visitors, and whoever orders tea gets it served in a collection of Victorian teacups – all of them gifts from local guests. Uwe Küster, who originally comes from Frankenberg in Hessen, used to work as a pâtissier and baker in Germany. Upon arrival in Canada, he started out by opening the “Chocolaterie Fackelmann”. In recognition of his new home, Uwe Küster invented the Fredericton truffle, a special recipe with Belgian dark chocolate and maple syrup, and even sent a box to Queen Elizabeth II. He considers it a high point in his career that she accepted the present. During their stay in the royal suite at the Delta Hotel, Prince Charles and the Duchess of Cornwall also tried the Fredericton truffles. Uwe Küster and his wife had the honour to be able to meet the royal couple during their visit to Saint John in 2012. Shortly thereafter, the enthusiastic home chef expanded his business to a restaurant, first in an old farmhouse in Woodstock Road, then in the Silverwood Inn and Suites building. The Schnitzel Parlour’s current location is on Union Street. This restaurant is definitely worthy of a visit, with its successful mix of Canadian-German fittings and authentic German gastronomy and hospitality. Beate and Uwe Küster are looking forward to welcoming and feeding you!